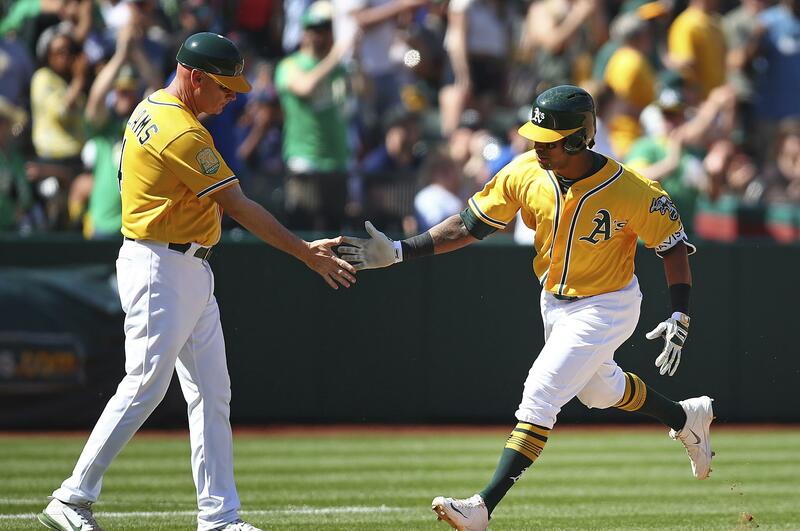 Sun., April 22, 2018, 9:10 p.m.
OAKLAND, Calif. – Khris Davis hit a tiebreaking, three-run homer off David Price with two outs in the eighth inning and the Oakland Athletics beat Boston 4-1 on Sunday, to deal the Red Sox consecutive losses for the first time under new manager Alex Cora. Boston had won its first six series before losing two of three at the Coliseum, where they were no-hit Saturday by Sean Manaea. They still have the best record in the majors at 17-4. Davis drove in all four runs for the A’s, and Blake Treinen (1-1) retired five batters to win. Price (2-2) allowed four runs and nine hits in 7 2/3 innings. NEW YORK – Gleyber Torres went 0 for 4 with a strikeout, double-play grounder, popup and flyout in his big league debut, and the youthful Yankees beat the Toronto Blue Jays 5-1 on Sunday when New York used a starting lineup that didn’t include a player 30 or older for the first time since Sept. 29, 1989. Luis Severino (4-1) allowed three hits and struck out six in seven innings, and David Robertson and Aroldis Chapman finished the four-hitter. Didi Gregorius homered, No. 9 batter Austin Romine laced a two-run double and rookie Miguel Andujar raised his average to .308 with a career-high four hits, including an RBI double, to help the Yankees take three of four in the series. Jaime Garcia (2-1) gave up four runs and six hits in 5 1/3 innings. The Blue Jays (13-8) lost consecutive games for the first time since opening the season with two home losses to the Yankees. ANAHEIM, Calif. – Brandon Belt hung in for a 21-pitch, 12-minute, 45-second at-bat before flying out and later homered. Belt fouled off 11 straight pitches and 16 in all from rookie right-hander Jaime Barria (1-1) in the first inning in the majors’ longest at-bat since records began in 1988. Belt singled and scored in the third and launched a leadoff homer against Blake Parker in the fifth. Belt saw 38 pitches in his first three at-bats, then hit the first pitch his last two times up. Johnny Cueto (2-0) allowed two hits in six shutout innings. Hunter Strickland got his third save when Ian Kinsler flied out with runners on the corners. Shohei Ohtani batted cleanup for the first time and went 1 for 4. LOS ANGELES – Cody Bellinger followed Yasmani Grandal’s two-run double with a tying RBI double in the sixth, and Corey Seager drove in the go-ahead run in the seventh inning of Los Angeles’ sixth win in seven games. The Dodgers were largely dominated by Jeremy Hellickson until they erased a three-run deficit with three big hits from their patchwork lineup. Los Angeles then went ahead after Austin Barnes was hit by a pitch from Trevor Gott (0-1). Barnes advanced to third on Chris Taylor’s single and scored on Seager’s fly. Josh Fields (1-0) survived a rocky seventh inning for the Dodgers (10-10), who got back to .500 after a rough start for the defending NL champions. DENVER – Nolan Arenado was initially called safe by umpire Cory Blaser when he tried to score on a bases-loaded pitch that bounced to the backstop, then was ruled out when a video review concluded reliever Brandon Morrow applied the tag on a throw from catcher Willson Contreras. Cubs star Kris Bryant was hit on the head with a 96 mph pitch from German Marquez in the first inning and left the game. Cubs spokesman Peter Chase said Bryant passed tests and had no sign of a concussion. Tommy La Stella, Kyle Schwarber and Victor Caratini hit RBI singles later in the first off Marquez (1-2). Javier Baez, who had three RBIs, made it 4-0 in the second with his seventh homer and Jason Heyward had a two-run single in the third for a 6-0 lead. Jose Quintana (2-1) allowed four runs and eight hits in 5 1/3 innings. Morrow got his fourth save. PHOENIX – Patrick Corbin (4-0) struck out 11 in six innings, and Arizona (15-6) became the first team since San Francisco in 2003 to win its first seven series. Nick Ahmed hit a two-run homer for the Diamondbacks. Archie Bradley struck out Jose Pirela with a runner on third for his second save. Rookie Joey Lucchesi (2-1) gave up four runs and five hits. BALTIMORE – Jose Ramirez homered twice and drove in three runs, and Corey Kluber (3-1) won his third straight start, allowing three runs and six hits in seven-plus innings. Manny Machado hit two solo homers for Baltimore, his third multihomer game this season. Baltimore (6-16) has lost ninth of 10. Andrew Cashner (1-3) gave up four runs and eight hits in six innings. DETROIT – Mike Moustakas hit a tiebreaking, three-run homer in the seventh off Buck Farmer after Drew VerHagen (0-1) walked two batters. The Royals won for only the second time in 12 games, and Moustakas extended his hitting streak to 14. Abraham Almonte’s sixth-inning grand slam gave the Royals a 5-2 lead, but Detroit tied it with three runs in the bottom half. Kevin McCarthy (1-0) became the first Kansas City reliever to win this season. Kelvin Herrera pitched a perfect ninth for his fourth save. ST. PETERSBURG, Fla. – Carlos Gomez, in a 2-for-38 slide, hit a two-run homer off Addison Reed (0-1) in the ninth. Daniel Robertson had a career-high four hits for Tampa Bay, which has gone 7-5 after a 1-8 start. Alex Colome (2-2) struck out three during a perfect ninth for his second win in three days. PHILADELPHIA – Aaron Altherr hit a winning single in the 11th after Andrew Knapp’s opposite-field triple off the left-field wall against Rich Rodriguez (0-1). Philadelphia swept a four-game series against Pittsburgh for the first time since May 12-15, 1994. Yacksel Rios (3-0) pitched a scoreless inning, stranding two runners. The Phillies have won 13 of 16 since a 1-4 start and are seven games over .500 for the first time since they were 24-17 on May 18, 2016. CHICAGO – Jose Altuve hit a go-ahead single in a five-run seventh inning, and Houston stretched its winning streak to six. Lance McCullers Jr. (3-1) allowed one run and eight hits over six innings as the World Series champions completed a three-game sweep in which they outscored the White Sox 27-2. Chicago has lost seven straight games and 12 of 13, dropping to 4-14. Aaron Bummer (0-1) was the loser. MILWAUKEE – Christian Yelich hit his first home run since coming off the disabled list. and Milwaukee completed a four-game sweep that extended its winning streak to six and dropped Miami to 5-16. Junior Guerra (2-0) allowed one unearned run and five hits in five innings, and Josh Hader also gave up an unearned run in getting six outs for his third save. Caleb Smith (0-3) struck out a career-high 10 in six innings for Miami, which outhit Milwaukee 6-4. ST. LOUIS – Kolten Wong and Paul DeJong homered to back Miles Mikolas (3-0), who yielded two runs – one earned – and five hits over seven innings. St. Louis has won eight of nine overall and 11 in a row over the Reds. Cincinnati has lost five in a row and 13 of 14. The Reds have the worst record in the majors at 3-18 and are 0-3 since firing manager Bryan Price and replacing him with Jim Riggleman. Luis Castillo (1-3) gave up three runs and seven hits in five innings. ARLINGTON, Texas – Nomar Mazara and Joey Gallo homered as Texas opened a 4-0 lead in the fourth against Erasmo Ramirez (0-1), who allowed five runs and five hits over 4 2/3 innings in his season debut. Martin Perez (2-2) gave up seven hits, walked a batter and hit another one in six innings before leaving with a 5-2 lead. Keone Kela worked a scoreless ninth for his third save. He allowed consecutive hits starting the inning, but the game ended when shortstop Jurickson Profar made a tough catch of a popup in shallow left field. Published: April 22, 2018, 9:10 p.m.